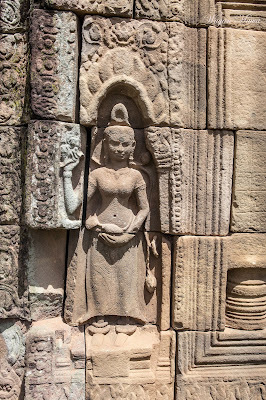 If you are traveling to Angkor complex or visiting Khmer temples probably you will notice that in every temple you enter, you will easily witness some beautiful carvings, ornaments, and many figures and figurines to decorate the temple entrance, walls, passages, etc. The most noticeable probably those figure of Apsara, the heavenly dancers or dancer of the God Kingdom in the heaven shown on earth. In almost in every temple you will find the Apsara, small size, medium or large size, flying Apsaras with many details, styles, shown how it was the dance, with different costumes, hair styles, accessories and beautiful faces. The process to build the temples and to carve these figures probably takes such long period of times. The work is so fine and very details in every carving displayed here. 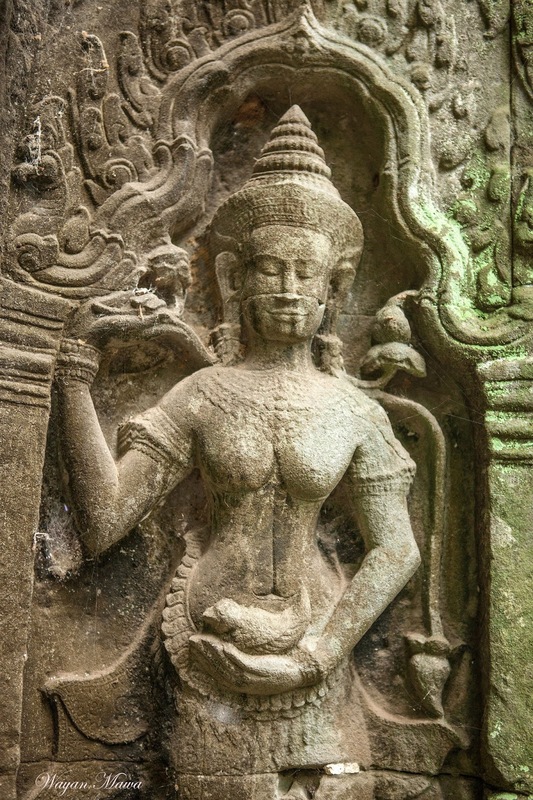 Talking about the Apsara; mostly in one temple, the style of Apsara perhaps has a bit similarity. The only different probably the cluster display, group of apsara from one lower level of the temple to higher ground like the apsara of the Bakan look prettier than other Apsaras in Angkor Wat. Their faces are also slightly different from one to the other or group of Apsaras to the other group in the different corner of the temple’s wall; this is probably because of the different individual worker or group of workers who carved these statues that perhaps their faces were copies of the Apsara’s faces or at least applied as self-portrait-carving kind of. During the pose or dance, the Apsaras dressed extremely beautiful with many accessories from head to toe. 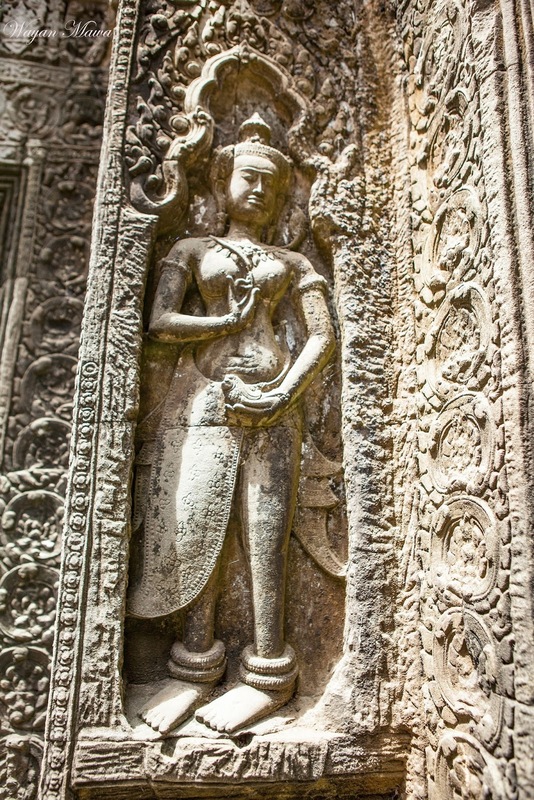 As well as every Apsara will carry her own things for purpose or something in her hands like lotus flowers, bouquet of jasmine flowers, flower arrangement on sticks, mirror, combs, offerings, as well as carry animals or something else. The Apsaras carried animals in her hands, I presumed that those Apsaras has their very own preference animal or their own pet/s. I found few of them carried bird/pigeon, rooster/chicken/bird, fishes, etc. I am not a scholar neither expert on Angkor but I love Angkor complex which I spent more than eight years in Cambodia in both Siem Reap (more than 6 years) and Phnom Penh (2 years). As I visited and explored the temple as many as 50-60 times, sometime I managed myself to discover something that I never see before in the temple complex. As soon as I start to detail evry corner of the complex as well as the carvings, hidden graffiti, the more I luckily see by my own eyes something new about this magnificent civilization in the ancient era, like this beautiful carving of Apsaras carried their pets. 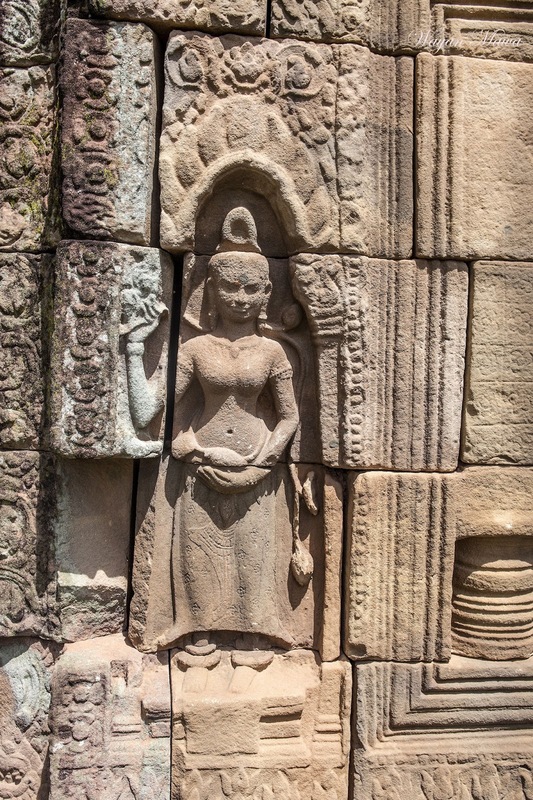 Why the Apsara carry animals? Apsara carries bird/ pigeon: pigeon is amazing creature and probably the oldest domestic bird that recorded in almost every era of civilization. It is show that pigeon is very smart, pure, intelligent, and has very good navigation ability. If you release the pigeon; it will be easily find its way back home. The pigeon has strong connection between itself, the owner and its surroundings. The pigeon is a lovely bird, strength, stubborn and the pigeon as symbol of accomplishments of some important work or tasks. Bird flies high into the sky that show strength, energy-fly away, view from above and bounce back! The dance to attract the unknown spiritual source to bring the blessing back to earth for the people in the Khmer Kingdom! Apsara carries rooster/bird/chicken/female chicken: rooster symbolize abundance blessings today’s life of providence, a thankful gesture to be born, it is positive relation between human and creator. It is between mind and super mind, intellectual and super intellectual, sexuality, fertility, grow and future. It is after the equinox of chicken egg, it is dynamic, balancing and popular as domestic animal very close to human as well as to create harmony. The spirit of the rooster is that usually use instinct to detect the ground to search food and keep it to her chicks. The beauty symbol of the roster is also for motherhood power of keeping relationship harmonious, responsible and productive, and protective. All vibration that Apsara show us when she carried rooster while she socialize and appear in the public. Apsara carries fish: in this topic of the Apsara carries fish probably more complex compare to few others scenes that I saw in the temple. Fishes related to water, blue water, instinct, depth (probably of knowledge), mysteries and consciousness. The fish is a symbol of birth in the womb of water of deep lake of the Tonle Saap; which probably live many spices of fish alive and nobody have any clue actuality how deep it is and what living creature that live in it. Nobody can see the bottom of the lake, the people of Angkor probably just guess with uncertain answer left behind. In the east, the fish is a symbol of good luck, happiness, fertility, knowledge and abundance. The Apsara dance with fish in her hand probably is to wish you good luck, give you abundance of energy, knowledge as well as harmony as the fish swim in deep blue water that calm, intelligent, happiness and eternity will merged together in the act of blessing dance ceremony. In Hinduism the fish is a form of avatar of Vishnu as Matsya, a giant fish with human head skimmed to save the planet earth. While in the Buddhism, fish is one of the eight auspicious symbols as follows: white conch, precious umbrella, banner, golden fish, dhama wheel, drawing, lotus flower and vase of treasure. 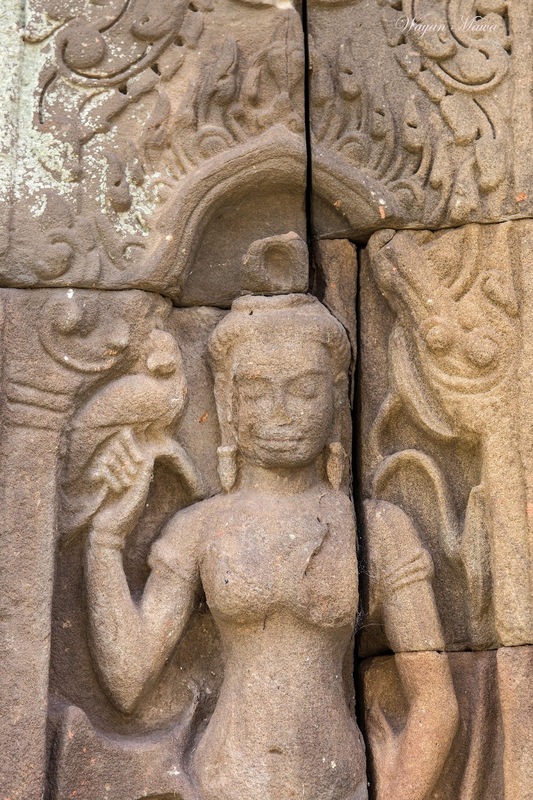 In the Khmer philosophy (mostly based on Hinduism and Buddhism), bird, rooster, fish and probably other few animals have their own meanings and symbols toward faith, spiritual and daily life. Recently I only discovered 2 different Apsaras with their pets around the temple in Angkor complex at Ta Phrom temple as well as 1 or 2 at the Nokor Bachey temple which is 1 of them I am not sure if it is really animal or something else as the figure has very bad condition, but I am pretty sure a lot more need to discover in few other locations in the future. If you found new feature of this kind, please update to get better information.